Amazon’s Seattle hiring frenzy slows sharply; what’s going on? The city’s largest employer has 3,500 job openings posted, down by more than half from this summer. Data show its open positions are the lowest in several years. Is it a logical pause, a new discipline or something else? Amazon’s hiring boom is cooling off. The company, Seattle’s largest employer, appears to be seeking the smallest number of new employees in the city in years after a feverish, four-year growth spurt that more than doubled its head count. Open job postings at Amazon’s headquarters, which stood at more than 9,000 as recently as June, have declined sharply and steadily in the last few months. The company was seeking 3,503 workers in Seattle on Friday, the lowest since 2014 among periodic snapshots tracked by The Seattle Times, as well as archived web pages. Separate data compiled by The Conference Board for the state of Washington show Amazon posted the fewest job listings in King County between August and November of any four-month period in data stretching back to June 2015. Several employees across a range of teams at Amazon describe hiring freezes or postponements, reorganizations to reduce redundancy or layers of management, and, in at least one case, cutbacks in travel spending. The online retailer’s apparent appetite for workers remains gigantic, however. Amazon’s openings in Seattle exceed the combined Washington state postings of Microsoft, the University of Washington, Nordstrom and Starbucks. Still, the pullback is a reminder that Amazon’s frantic expansion during the last few years — contributing to a boom that nudged the city’s unemployment rate near record lows, pushed housing costs to a record high, and sparked a debate about the company’s civic role in Seattle — won’t last forever. The slowdown also comes as the company seeks space to expand outside Seattle. 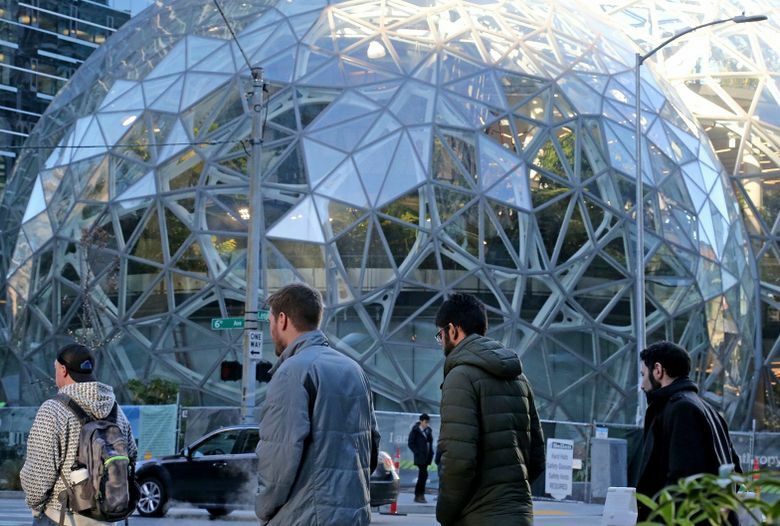 Amazon is evaluating 238 bids it received from municipalities interested in welcoming Amazon’s second, “equal,” headquarters dubbed HQ2, which the company has indicated it could begin staffing as early as 2019. Amazon spokesperson Teal Pennebaker said Amazon is continuing to hire for thousands of positions across the company, and didn’t offer a specific reason for the drop in open positions in Seattle. The company’s headquarters is home to more than 40,000 of the 541,900 worldwide employees Amazon reported in its most recent quarterly filing. Evidently, though, many teams are coming up with the same message, according to employees who spoke on condition of anonymity. One employee said recently that her team was trying to be more disciplined with hiring after a binge that more than doubled the size of the unit in a two-year period. Another employee, an engineer, said his manager said some groups were stepping on each others’ toes, duplicating work. The unit had in place a hiring freeze on new roles, he said, and was in the process of combining some teams. A third employee said an order from on high had curbed his unit’s travel budgets, a move portrayed to the rank-and-file as a cost-cutting measure. Amazon’s general and administrative expenses, a catchall category for corporate functions and costs not assigned to building and selling specific products, totaled $2.6 billion during the first nine months of the year, up 53 percent from a year earlier, and a 94 percent increase from the same period in 2015. On July 17, a Monday — the day of the week when new hires arrive on Amazon’s South Lake Union campus — Amazon set a new high-water mark. That day, the company welcomed 767 new employees. That’s more than most local employers hire in a year. The bumper crop came as Amazon’s ambitions expanded far beyond online book sales. The company is trying to broaden its reach into other corners of retail, including clothing, furniture and office supplies, goods the company distributes with a growing logistics network that spans dozens of warehouses. Amazon is increasingly a fixture in the cutting edge of technology, building its own tablets and e-readers, cloud-computing tools for businesses, and the voice-activated Alexa digital assistant. About 60 percent of the company’s open positions in Seattle today are for jobs in the company’s technology arms: Amazon Web Services, Alexa and devices. Jeff Liboon joined Amazon in 2014, among the first few employees on a new marketing team for the company’s app store. By the time he left Amazon last September, that group numbered more than 30. Some close observers of Amazon say a pause would make sense after such growth. Since 2010, Amazon has added an average of more than 5,000 employees a year to its Seattle head count. The retailer has expanded at similarly feverish pace outside of its home base, driven by a ramp-up at its logistics arm and the August acquisition of some 89,000 Whole Foods Market employees. Amazon’s total of 541,900 worldwide employees at the end of September — a number that trails only Walmart among U.S. companies — was up 77 percent from a year earlier. “This is a company that has grown so fast that human resources can’t keep up,” said Suzanne Dale Estey, a partner with Gallatin Public Affairs and a former chief of the Economic Development Council of Seattle and King County. The current lull could be temporary. One Amazon employee not authorized to speak publicly said that his unit had halted hiring after exceeding its budget, but they were told to expect it to ramp up again sometime next year. Hiring in the U.S. tends to dip after Thanksgiving, a period that, for Amazon, also brings competing priorities like the holiday spike in orders and the second edition of a twice-yearly planning process. Meanwhile, the company’s plans chart more growth for Seattle. Two leases disclosed in October, one for all the office space in a planned downtown skyscraper called Rainier Square, the other for the upper floors of the downtown Macy’s building, would give Amazon space for an additional 5,000 workers. A pause could be healthy for some other companies that are used to Amazon vacuuming up all available employees, said Megan Slabinski, district president with recruiting and staffing firm Robert Half. Western Washington’s labor market is used to booms and busts, from Boeing’s massive fluctuations to Microsoft’s rise on the Eastside and the implosion of Washington Mutual. Each company, in turn, became a target for much of the credit or blame for prevailing trends in the broader economy. That’s especially true of Amazon, a company whose Seattle footprint is more than twice as large as that of any other company in a major U.S. city. The company figures prominently in debates about Seattle’s rising homelessness and housing crunch, congestion on streets and highways, and worries about a growing gap between the rich and poor. Amazon is not the only company behind the city’s growing pains: Seattle boasts a robust technology startup scene, as well as growing satellite offices of Google, Facebook and other Silicon Valley companies. But the giant plays a leading role in the economy of the city it has reshaped.